If you've reached Annette Funicello Part 2 first, and would like to read Part 1, click here. After phone calls from tabloids to neighbors, friends, and family asking about her health, she finally decided it was time to go public with her illness. She called a publicist at Disney and told them to get in touch with USA Today. She was going to go nationwide with her diagnosis of MS.
She felt that no one wanted to believe that something bad could happen to "Annette Funicello". Once she went public, she received support from friends and family. They offered their love and prayers. She tried many different therapies that were available at the time. She tried steroids, acupuncture and acupressure, herbal medicines and vitamin B-12 shots in her legs. None of them seemed to help. Her Catholic faith and her determination have helped her to cope with MS. Her family has become closer. Her husband has always been by her side. She knew she had to make certain adjustments to cope with her disease. She exercised three times a week and tried not to stress out. She told herself that tomorrow would be better. Annette is a fighter. She doesn't want to be treated like an invalid or have people feel pity for her. She lives each day with the hope that there will be a cure for MS. 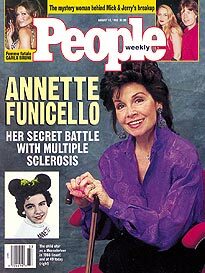 In 1993, she started the Annette Funicello Fund for Neurological Disorders at the California Community Foundation. 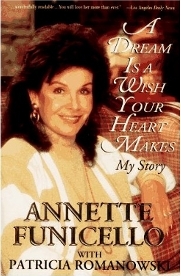 In 1994 she published her autobiography - A Dream Is a Wish Your Heart Makes: My Story. This, in turn, was made into a TV movie. “A Dream Is a Wish Your Heart Makes” in 1995. That same year, she began the Annette Funicello Collectible Bear Company. The last collection was released in 2004. You can still find a few circulating if you look. In the past few years, MS has made life more and more difficult for Annette. She has vision problems, breathing problems and at times it's hard to talk. Her family makes things as comfortable and normal as they can. Through it all, she continues to be poised and hopeful. If you like to reminisce, or even if you've never heard her before, watch her interview as she talks about her music. You can see why so many people love Annette. And here is a tribute to her by one of her long time friends - Vince Smith, a singer. He wrote this song, "My Annette" specially for her. In his later years, he also developed MS.
As we all know, Annette passed away in April of 2013. This touching video is an interview with Glen Holt and some of her friends about the progression of Annette's MS before she died. Her courageous fight is an inspiration to us all. After getting treated for CCSVI, Glen saw imporvements, though small, they were definitely improvements. Through Annette's fund (see link above), he is asking for money to help fund research for CCSVI and other treatments that could help alleviate this disease as well as other neurological diseases. Annette had a particularly progressive form of multiple sclerosis. One that continued in a downward progression over the years, rendering her unable to move or speak. This is a more rare form of the disease. Most people (about 75-80% begin with RRMS and about 50% of those go on to a more progressive form like SPMS). After watching this video, please scroll back up and consider donating to her fund to help eradicate MS.